Distributed By – PolyGram Group Distribution, Inc. This version most easily identified by "Made by Discover Systems - An American Company" text around center of discs. 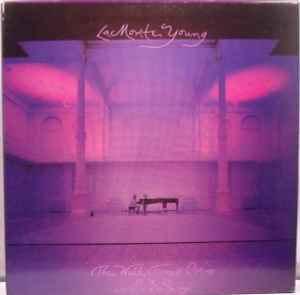 Performed by La Monte Young in a setting of The Magenta Lights by Marian Zazeela. Recorded live at the last 6 Harrison Street Dream House concert of The Well Tuned Piano, New York City, October 1981, presented by DIA Foundation. Instrument by Bösendorfer. Includes 26 pages large booklet. La Monte Yong In the 60's. studied the properties of the expanded tonality and the development of a specific concept of time, which was based on the idea of ​​freeing from external time, creating a peculiar funnel through a minimum of compositional techniques, through which penetration into an isolated infinite time space occurs. The development of this idea became the main task of his musical team Theater of Eternal Music (also known as Dream Syndicate), among whose participants were Terry Riley, Tony Conrad, John Cale and others. I paid something like 14p to request this at our local lending library and felt bad when I took it out again a couple of years after I initially borrowed it and found I had been the only person ever to take out this assumedly fairly expensive item. Now I see what price it goes for it would be nice if they made some cash off it, but I am reasonable sure it would have been sold in one of their annual clearouts for £1... or perhaps they still have it?